The sensational final thriller in the Carnivia Trilogy, from a Sunday Times bestseller. Book 3 in The Carnivia Trilogy. He died in the darkness, surrounded by friends. They found him at sunrise, on Venice's most popular beach. His throat had been cut, his tongue removed. Captain Kat Tapo suspects a Masonic murder. The brotherhood won't give up its secrets to a policewoman - but Kat won't give up the hunt. She'll use all the allies she has: friends, lovers, hackers, spies. This is the third novel in a trilogy of stylish and intelligent thrillers set in Venice from Jonathan Holt who, under the name J.P. Delaney, is also the author of the Sunday Times bestselling psychological thrillers THE GIRL BEFORE and BELIEVE ME. 'A genuinely thrilling thriller that is also an illuminating portrait of a particular world ... A terrific book' Literary Review. 'A genuinely thrilling thriller ... a terrific book by any standard ... outstanding' Literary Review. 'A cracking, upmarket thriller' Saga Magazine. 'Impressive ... Venice is a magnificent backdrop' Daily Mail. 'Awesome, awesome, awesome!! To say it was a page-turner is an understatement!' Lovereading. 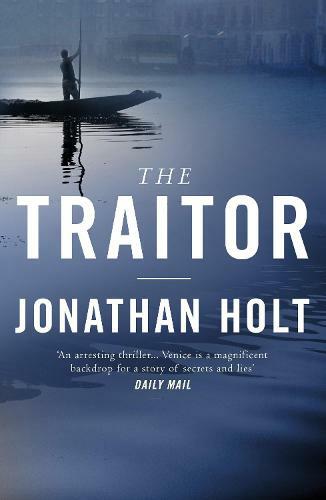 'The talented Jonathan Holt's best book yet ... its disparate elements bubbling over in entertaining fashion, and its protagonist guaranteed reader interest, and the sheer unabashed energy of The Traitor is hard to resist' Good Book Guide. 'A suitably thrilling finale ... The author was apparently inspired by a visit to Venice, and it certainly makes for an interesting setting, especially when Holt gives us a taste of the real city hidden under the tourist hype' Crime Review.